Soft, watercolor roses show your colorful side and your artistic style. The watercolor rose design accents the top and bottom of the bright white wedding invitation card, making it a lovely introduction to your floral-themed wedding anytime of year. Choose two lettering styles and two imprint colors for your wording. Invitation includes inner and outer envelopes. I stumbled across this site when researching invites for my summer 2018 wedding. Compared too other sites this was the most affordable. Was very pleased with my decision too order. Invites came quickly and nicely packaged. Last but not least loved the option to preview and make changes to invites as many times as I wanted before the final purchase. Would definitely recommend site too anyone in search of invites for any occasion. My order arrived very fast and accurately. The color and print was even prettier than in the pictures. This product was really pretty, and was perfect for our wedding. Just be careful with the text-for this or any invite via internet. I suggest ordering a proof of ANY product or looking really closely at the text. Some of the letters overlapped because I changed the font, etc and didn't look closely at each line to check for perfection of how it all worked together. While nothing is terrible or makes me want to reorder, I wish I'd looked more closely. Just a little advice. I bought my wedding invitations, RSVP cards, and reception card and envelopes. They were just what I expected. I ordered a sample invite for free from thier website. I would highly suggest that and order extra invites and envelopes. Great service and beautiful products. The invitatons are lovely and your customer service is outstanding. LOVE these invitations and extra card options. They turned out beautiful. I was initially disappointed that there is no thermography printing option (we contacted customer service to try and do a special order but the answer was still no), but instead we went with the textured paper to give the card a little more character. The result is gorgeous! So pleased with the purchase and it shipped quickly. Great value! We LOVE the invitations, the response post cards, and the thank you cards that we ordered. They look just like their previews on the website. We especially love the font selections that were made available and the color choices. We took advantage of the semi-annual sale and SAVED! We also appreciated the option to add extra envelopes to account for the inevitable address mistakes. One thing that we felt was an added bonus is the coordinated wedding website theme found on weddingwire.com...now everything is cohesive! The invite was beautiful.. however our names were TOO small :( I wish we could have the option to order just one tangible copy so that I could see it and make necessary adjustments. The online proof they give you is obviously not the same size as the invitation unfortunately. I am happy with our wedding invitation set! The coupon process was somewhat confusing as promo codes would change/expire unexpectedly. However, customer service was prompt and helpful! Loved my invites once I received them. I only wished that my lined envelopes were not folded backward causing creases and breakup of their color. Also wished that the invites could have already been placed in envelopes ready to be mailed. Other than those minor gripes, I am very satisfied with the quality of the product. I ordered my wedding invitations and reply cards and could not be happier; great overall experience. It did take about a week to receive invites, but it was worth the wait! I will recomend invitations by Dawn to all my friends. They are the most afordable and prompt. Also, who does not love they offer free shipping. Thanks! When I originally received my order (wedding invitations), the ink was light and not easy to read. I called the customer service center and was afraid that they would give me a hard time, or make me pay to reprint the order. However I spoke with a representative who was extremely courteous and helpful. He quickly apologized and put in an order for an entire new set of invitations that were delivered in 3 business days at no cost to me. The second shipment was perfect and I received multiple compliments on how beautiful my invitations were. This card was the best I could find for the money for my summer wedding. Everything came exactly how it looked online and the sample that I got was just how the invites were printed which I was very happy with. I wish there were more personalization options when I was looking through this group, such as programs and other types of paper products. Overall they came quickly, looked great, and I am very happy. We absolutely LOVED our wedding invitations; they have such a professional quality about them, all our friends were amazed at such stock and quick, reliable service. The invitations came quickly and were in great condition. The personalization options were great and easy to design. The invitations were absolutely beautiful! I ordered this product in Shimmer paper. It looks so elegant and looks expensive. The picture online doesn't do justice. Highly recommend. Will be using Invitations by Dawn again!! I ordered invitations for my wedding which is this July. I cannot wait to mail them out to our guests; they are beautiful and exactly what I had pictured. The colours match our theme perfectly. I will be ordering the coordinating thank you cards, and am excited to search for bridal shower invitations for my girlfriend. 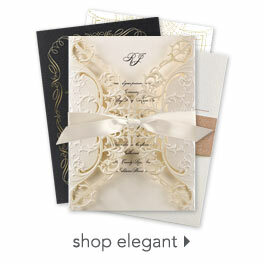 Thank you for providing affordable, yet beautiful wedding invitations!! After having an awful experience with another wedding invitations company, these invitations I got from Invitations by Dawn are incredibly perfect. I found their website easy to navigate and to fill in the invitation info, loved the free sample that arrived quickly, and the invitations arrived much quicker than I expected too. The blue rose watercolor is the perfect color, and these invitations are exactly what I was looking for! Came out great. Loved the email option so daughter(out of town) could see & review before ordering. Very quick service.Had a question right after ordering and was happy to speak with someone to answer it, especially in the evening.Wish you had a better menu card selection. These invitations were great for our wedding. Everyone thinks they are beautiful.